FLASH BACK: Police and soldiers heading to the direction of the fence within which they cannot receive contraband items that easily. Sixteen prisoners were shot and two fire fighters were injured during efforts to prevent another escape from the Lusignan Prison Saturday afternoon, officials said. “Prisoners were fighting each other and were rioting against officers. Despite several warnings they did not comply. Force was used,” Director of Prisons, Gladwin Samuels told reporters. He said pellets and rubber bullets were used. Government’s Department of Information said 16 prisoners were shot and suffered minor gunshot injuries and another four suffered injuries as a result of fights among the prisoners. Authorities said there were no deaths or escapes. Government said three of the 16 who sustained gunshot wounds and two who suffered injuries as a result of fights were taken to the Georgetown Public Hospital Corporation (GPHC) for treatment while the others were being treated on site at the Lusignan Prison Infirmary. “None of those who were shot are, at this time, deemed to be in a life-threatening condition,” government said. Fire Chief, Marlon Gentle said two fire fighters were injured while they were wetting the main prison building after receiving reports that prisoners in the recently asphalted holding area were allegedly throwing Molotov cocktails at the wooden building. They were rushed to the Georgetown Hospital for treatment. Gentle said when the fire fighters started spraying water on the roof, inmates in the holding area pelted them with bricks resulted in head injuries to two members of the Guyana Fire Service. “As a last resort the use of force, including firearms, was required to restore order and maintain the integrity of the holding facility,” government said. Other sources said the ruckus was sparked off by efforts of the joint services to search the holding area. 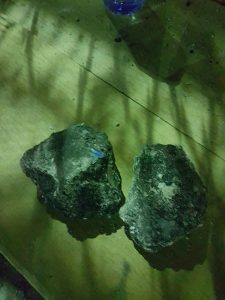 When the servicemen entered the facility, they were stoned by the inmates, sources told Demerara Waves Online News. Inmates, who are in possession of prohibited items such as cell phones and improvised weapons, have been known to resist searches by the security forces. So far several prisoners, who escaped during the fire at the Georgetown Prison on Sunday July, 9 and 13 who burrowed out of the swampy Lusignan holding area on July 24, 2017 are still at large. 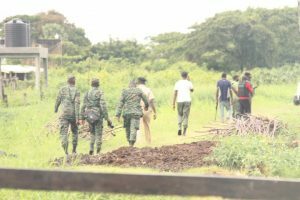 The remaining prisoners from the swampy area were moved to the brick prison at the Camp Street location in July 24, where they had also broken up beds and damaged walls during another unrest that was quelled by the security forces.